As per usual tradition, my feet are up, my computer on and in general my activity level hovers around nil. My 2nd two liter bottle of water sits besides me three-quarters full. More work to be done there before the day is out. Dinner, with friends Kristin and Tarek, calls for fish - again as per my custom. So, lots of little traditions before a much bigger one. One tradition is the pre-marathon call for donations. This race is particularly special as I am running for the local charity Rays of Sunshine. I am using justgiving.com to donate to them. Last night, I got to meet a few people from the charity in a small gathering. Genni and Olivia from the charity (and hopefully Jane Sharpe, Executive Director, whom I met on a plane in 2010) will be on Tower Bridge cheering us on. I met Ross, a fellow runner and a veteran of the race; he is looking for a good pace; we'll see how we both do. Thank you to the many people who have already donated. This trip in fact has been punctuated by history and traditions which create a tidy package of ideas for this last email blast blast/blog post. 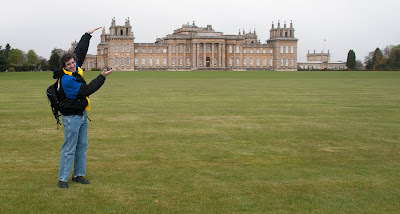 Friday, Rebecca and I went by train to Oxford to visit Blenheim Palace. The 22,000 acre estate upon which the palace sits was gifted to the first Duke of Marlborough and his wife Sarah upon the successful campaign against the French by the Duke (born as John Churchill). In 1702, the French king, Louis XIV, propped his relative on the throne of Spain upon the death of the Spanish King. This Pyrenees separated juggernaut did not amuse the British or the Austrian-Hungarians, so in typical (traditional?) diplomatic fashion, they formed an alliance and attacked the French. The British did not have a true standing army, and Marlborough led a group of mercenaries in a successful campaign to save the Continent. A key battle was fought at Bedburg in southern Saxony where the prize was the defense of Vienna, just down river from the fighting. This August 1704 victory spelled the beginning of the end for the French (although the War of Spanish Succession as it was known lasted another decade). Marlborough hurriedly penned a note to his wife Sarah on the back of a pub receipt. Sarah was part of Queen Ann's court, and she immediately told Her Majesty the news. The Queen as a gift bequeathed the former royal hunting grounds outside Oxford to Marlborough. Also in typical fashion, Bedburg just wouldn't do for a palace name, and the Anglicized version of Blenheim came into our vocabulary. That's all well and good. And you can find all of this information accurately reported in Wikipedia. What makes going on a trip and seeing these sort of things in person is how they come alive when you are there. In our case, this was assisted by the tour guide we and thirty others listened to give the history of the Marlborough family, the estate and the decorative arts. (Tapestries. Lots of them. I felt like a Scottish Lord inspecting them. If you don't get that, don't worry; those of you who do - well you know who you are.) Sadly, we joined the tour after the gentleman had made his name known, so I will just call him Reginald. Reg for short. See, it's not that big after all. Reg loves the Marlborough family and the 11 men to hold the title of Duke. Clearly, Reg studies the artifacts, books and papers of the family. His "30 minute" tour was more like 45 because he could not stop giving facts, notes and suppositions. But rather than drag on, he was quite entertaining. His passion was infectious (particularly about those tapestries - commissioned by the first Duke to commemorate the victory at Blenheim). I took away a feeling of knowing that Reg was fulfilling his purpose in life with joy as he shared tale after tale about the 4th Duke and the 8th Duchess and the grandson of the current Duke and more. Interestingly though, while John Churchill, First Duke of Marlborough, may have saved England and her allies, the most famous and most world-alternating person associated with the house was not a Duke but rather the grandson of the 7th Duke (and then later nephew and cousin of Dukes 8 and 9). This, as you have likely guessed by the name, was Sir Winston Churchill, born at Blenheim on November 30, 1874. The house features a small museum of the former Prime Minister, soldier and author with copies of various letters he wrote throughout his life. Some of his paintings of Blenheim are displayed as well. The museum spills into the small room where the great man was born. Thanks to Reg for bringing all the history to life. Yesterday, on my way back from the Rays of Sunshine meet up, I grabbed a taxi to journey back to my hotel. (Traditionally, I take the Tube, but there was not efficient route between the two hotels.) I love London cabbies. While I have had my share of cantankerous ones over the years, almost all are friendly, proud of their city and chatty. My driver last night noticed my Antarctica Marathon jacket and correctly guessed Sunday would find me in the throngs eschewing his manner of transport in favor of hoofing it 26.2 miles from Greenwich to Buckingham Palace. Sadly, I also neglected to get his name, so we will call him Paul. Now Paul owns his taxi cab and is quite proud of it. Somehow, in our conversation about the marathon, we shifted to World War II. I honestly cannot recall how we did that. In any case, he related to me how his father had fought in World War II in France. In 1942, Paul Sr., originally from East London, became a member of the Somerset Regiment (Somerset being out of young men to recruit as replacement troops). In fact, a number of people from Paul Sr.'s neighborhood all got drafted together including his best friend. Sadly, during Operation Market Garden in Holland, September 1944, Paul Sr. saw his friend get killed in the fighting. As the Allies retreated under a German counter-attack and a bridge too far remained uncrossed, Paul Sr. left the resting place of his best friend. Taxi driver Paul did not know how the subject came up, but 6 years ago, just as Paul was purchasing his cab, Paul Sr. wondered about the grave of this long dead chum. (It was in fact on Remembrance/Veteran's Day so that is likely the reason.) Paul said that a fine way to break in the cab would be to drive to Belgium to find out. Paul had found the grave on a website listing such things, and Belgium was in fact where the body had been ultimately buried. Paul said the trip was moving as we all can probably imagine. The friend had been an only child, and every other grave in this small municipal yard had some sort of person marking on the tombstone - carved by some visiting family member. Yet, Paul Sr.'s friend looked like it had not been visited until Paul Sr. and family came in 2006. I was happy to hear the sad tale because it reminded me of when we visited my wife's uncle's grave in similar fashion in 2003 in Cornwall; our suspicion was that no one had visited from the family since my father-in-law when he was station in London in 1944. Thanks Paul for sharing your story. As for the game? A solid defensive effort. Final score a 0-0 draw. The first in 7 years and 1 day between the two teams. The last match featured 8 goals and a 5-3 Arsenal win. Those expected that firepower left disappointed. The BBC put it this way: "For two clubs who have played out so many classic encounters over the years, this once deserves to be forgotten as quickly as possible." At least Miri, Tarik and I had fun! And we did not buy those expensive seats at Emirates Stadium. Thanks Miri and Tarik for hanging in the pub! Chris Brasher won an Olympic Gold Medal for Great Britain in 1956 by running with reckless abandon in the steeplechase. Told basically all of his life about the things he could not do, and having to overcome a terrible stammer developed at private school, Chris turned out to be a winner at every level. Oh yeah, he created the London Marathon. This apparently started in a pub so no one will admit when in the session of drinking this idea arose. Members of a local running club had just competed in the 1978 New York City Marathon. 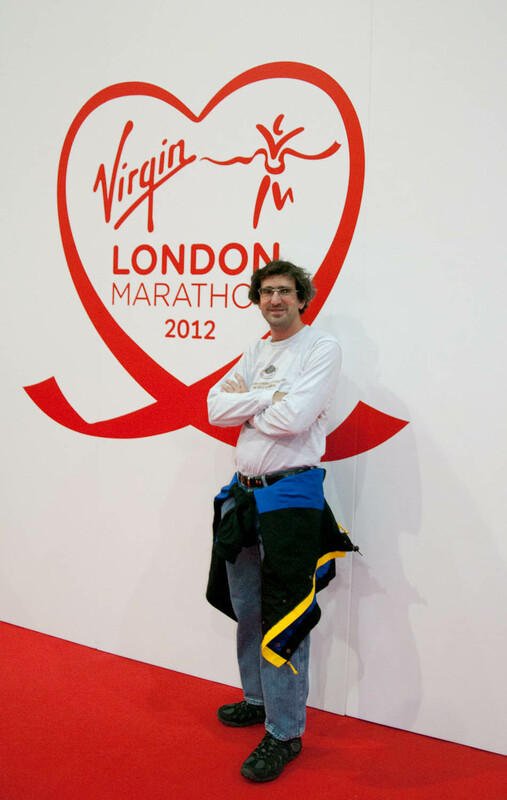 Brasher said to his friend, fellow runner and business partner John Disley, why can't we do that? So, having never run a marathon before, Chris and John took off for the 1979 event. Upon returning, Brasher wrote about the amazing experience they had for the paper. The city pride. The fan support. The amazing sights and sound. Could London hold such a great event he wondering at the end of his piece? Two years later, with the moral support of the authorities but not a dime of money from the tax payers, 6,255 people crossed the finish line near Buckingham Palace (where tomorrow's will end as well). Big Ben, the Houses of Parliament, Tower Bridge, The Cutty Sark, Greenwich, The City and more. Tradition through and through. 817,890 people have finished the race in the past 31 years. Nearly 40,000 will do so tomorrow. So, off I go to run in this tradition-filled country and city on a very special course. For those who are in a time zone conducive to following along (we run at 9:45 AM local time - 1:45 in California), my bib number is 53470. I'm in the Red Start (there are 3 start areas), and I should run a comfortable 3:50-4:00 time. Slow for me, but I'm under instruction not to push it given I had the flu for two weeks this month. Hopefully, I'll get lots of photos from the course to share after the race. Thanks to Rebecca for coming over the Pond and to all of you for all the support.